An unscrupulous Wikimedia trustee and a fellow, well-regarded Wikipedian in Residence have been accused of offering favorable article placement on the site in exchange for payment. When organization founder Jimmy Wales was confronted with information regarding a possible scandal, he affirmed his ignorance of the operation. However, a very unhappy Wales said that if the accusations do prove truthful, he condemns their actions as "disgusting". 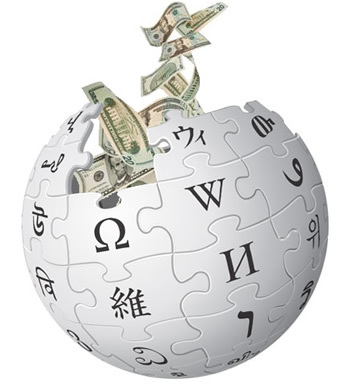 The Wikipedians who allegedly fell from grace are Max Klein, a once-respected editor, and trustee Roger Bamkin who is both a trustee and director for Wikipedia UK. Klein is accused of running untrikiwiki, an operation which promises visitors it can navigate around Wikipedia's rules in order to give certain sites more Google juice. More on Bamkin can be found on Cnet's look at the situation. A positive Wikipedia article is invaluable SEO: it's almost guaranteed to be a top three Google hit. Surprisingly this benefit of writing for Wikipedia is underutilized, but relates exactly the lack of true expertise in the field. ... WE HAVE THE EXPERTISE NEEDED to navigate the complex maze surrounding 'conflict of interest' editing on Wikipedia. With more than eight years of experience, over 10,000 edits, and countless community connections we offer holistic Wikipedia services. After receiving what was likely an uncomfortable level of public scrutiny, untrikiwiki posted its own response to accusations. Their rebuttal claims that untrikiwiki has "never made a single edit for which we had a conflict of interest on Wikipedia – ever." Wikipedia has many rules governing acceptable and unacceptable behavior, but as Cnet points out, Wikipedia UK doesn't have a set of rules explicitly prohibiting "paid edits". However, I think it's fair to say that such activity probably falls under Wikipedia's conflict of interest rules, even if untrikiwiki would disagree. One possible example of Wikipedia gaming might be Gibraltar. The tiny British territory happens to be Bamkin's client. Even more interestingly though, the small, peninsular country managed to appear on Wikipedia's front page a whopping 18 times via the "Did you know?" section -- and that was just in August. And if that doesn't sound peculiar enough, Gibraltar was also the only other topic to appear multiple times in the DYK? section, beside the Olympics, of course. Appalled by this possible subversion of trust, Wales labeled the act as "wildly inappropriate". In a statement made on Wikipedia, Wales said some policies don't exist simply because they've never needed to, but then made his stance on the matter very clear: "The idea that we should ever accept paid advocates directly editing Wikipedia is not ever going to be ok". Despite his strong views on this behavior, Wales' statement also indicates that this offense may not be grounds for shedding Wikipedia of Klein and Bamkin. "We have traditions of forgiveness and working with people to improve their behavior and ours whenever we can", he reminded.